This is a food product development and manufacturing agreement, also suitable for drinks, skin care, and other regulated products. Under it, the manufacturer develops your ideas with you, before producing saleable products for you. This contract sets out the terms of an arrangement where a person or a business that has ideas for a food, drink or cosmetics product works with a manufacturer on the refinement of the recipe before having the product made in quantity. It sets out the product development process, from sending samples for approval, to passing quality control tests, complying with national or international standards, and ultimately making up the order. It is suitable where one of the parties is not based in the UK. Particularly important is intellectual property protection. When both parties work on the recipe and perhaps the manufacturing process, who owns the rights to the IP is important. 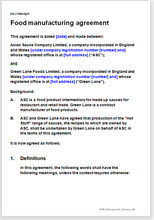 This document transfers all created rights to the client. There is little statute law to regulate this agreement so it relies on common law: contract, tort, and so on. Of course, there are regulations affecting your product. We have provided for your manufacturer to comply with specific, exact requirements you have set out in a schedule. This document specifically covers production of food or beauty products. Our shorter version (for any type of product) contains fewer terms relating to the development of the product and might be more suitable for a food that doesn't have many ingredients, or where the process is simple, such as when canning or making a juice of a single fruit. You may want to invite several manufacturers to tender for your work. This set of tendering documents guides you through the process.